If you’re fighting against an impending foreclosure, then mortgage loan modification is one of the options available to you. Mortgage loan modification allows you to lower your interest rates and reduce your monthly payment. These steps are designed to keep you and your family in your current home by avoiding foreclosure. If you can demonstrate financial need and have a mortgage under $700,000, then you may be eligible for substantial savings through mortgage modification. Mortgage Loan Modification - Federal Help? If you are currently struggling with your monthly mortgage payments, then you may be at risk of foreclosure. One of the best ways to ensure that this doesn’t happen to you is to seek mortgage loan modification, which changes the terms of your existing mortgage. Using this, homeowners receive a lower interest rate and a more advantageous monthly payment schedule. Ultimately, it could make the difference between you keeping, or being evicted from, your home. 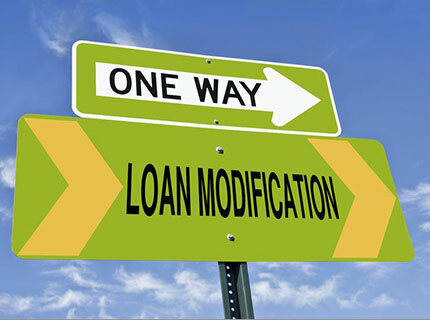 How Does Mortgage Loan Modification Work? Basically, a third party alters the terms of your mortgage in order to make it more affordable. These adjustments are permanent, and will result in a lower interest rate. Unlike mortgage loan refinancing, having an undervalued home will not disqualify you from participating in the program. In fact, it could give you an advantage in negotiations. This is one of the major advantages of mortgage loan modification: the ability to modify the loan of an undervalued home. For example, some people have homes that are worth only $200,000, when the mortgage that they took out several years ago is actually closer to $300,000. Even if you were able to refinance this mortgage, it would do little to help out your financial situation. The actual process of modifying your loan is quite simple: a representative contacts your lender on your behalf in order to determine your eligibility. Then, if eligible, that representative will ask for a reduction of the interest rate on your mortgage. And, if this isn’t enough to prevent the foreclosure of your home, then the representative will ask for a long repayment period in order to reduce the monthly rate. Unlike mortgage refinancing, your interest rate will always go down after a modification. While eligibility differs according to the individual, this process has helped millions of Americans avoid foreclosing on their home, making mortgage loan modification one of the most popular financial aid programs in the country. How Can The Federal Government Help? Since the recession in 2008, preventing foreclosure has been a key goal of the Obama administration. Over the last few years, the government has instituted several programs that make it easier for home owners to get the financial assistance that they need. Often, this assistance comes in the form of a mortgage modification service from Fannie Mae or Freddie Mac. If your mortgage is worth less than $729,500, and you can prove financial hardship, then you may be eligible for this new mortgage loan modification plan. Since the service is free, and there is no risk to apply, this new mortgage program can literally be the difference between keeping and losing your home. Mortgage loan modification might help you out of a tough situation, but the rest of your finances must be stable in order for a loan modification to be successful. If you can get a lower monthly mortgage payment, then by all means do so because your chances at avoiding foreclosure are better. Get Mortgage Loan Modification information delivered directly to your inbox.